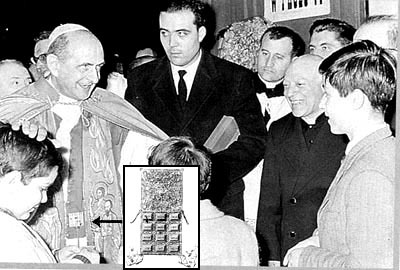 I have seen on several websites the photo of his Holiness Pope Paul VI wearing the 12 stoned breast plate in minature of the Jewish high priest. During my studies of medieval Liturgy I found that many Bishops in central Europe used a form of the Rational of Judgement as an accessory to their Vestments. I find it difficult to believe that this could have been an accomodation to Judaism. Can this criticism of Pope Paul VI not simply be through ignorance and lack of knowledge of the historical Liturgies of the Church? Fr. Joseph D. Santos, Jr.
1. The rational, a square piece of gold jewelry, was initially a pectoral ornament worn to distinguish important functionaries of Egypt (F. Vigouroux, Dictionnaire de la Bible, entry Pectoral). 2. God wanted His high priest to wear a similar ornament to emphasize the sacerdotal importance, and for that end, He described in detail how it should be made and worn over the ephod (a kind of vest). This new ornament was a gold breastplate inlaid with 12 stones engraved with the names of the 12 tribes of Israel (ibid., referring to Ex 28:15-29; 29:8-21; Lev 8:8). 3. The high priest should wear the rational, or pectoral of judgment, when he entered the Sanctuary to offer the solemn sacrifice (Ex 29:30; Eccles 45:12-3). 4. After the crime of Deicide, the apostasy of the Synagogue, and its separation from the Catholic Church, the liturgical garments of the high priest continued to be worn in the Jewish religion, even after 70 AD, when the Sanctuary and the whole Temple were destroyed by Titus. But its use was discontinued in the Catholic Church, which created her own liturgy, even though it was often inspired by former practices. 5. In the Catholic liturgy, the name rational was given to different pectoral ornaments for Bishops worn in place of the pallium. A more precise description of them can be found in The Catholic Encyclopedia (entry "Rational"). As you mentioned in your comment, these were used in some medieval Dioceses from the 10th to the 13th century, when such practice was discontinued. Only the Diocese of Reims (France) maintained usage of the adapted rational until the 16th century, when it was discontinued there as well (ibid). 6. In the present time, it is only used by the Bishops of Eichst, Paderborn, Toul, and Krakow in Europe (ibid.). The shape of such ornaments, however, is different from the rational worn by the Jewish high priest (ibid.). 7. The Catholic ornaments of the Sovereign Pontiff are quite well known, and, as far as we know, they do not include any rational, but rather the pallium. 8. Therefore, Paul VI clearly made an innovation when he wore the Jewish breastplate on many different occasions. After much research, TIA has never found any official explanation for his action. Therefore, it seems fair that each one can interpret it the way he wants. 9. Given that Paul VI’s rational is clearly a smaller copy of the rational worn by the Jewish high priest, the most probable interpretation for its use seems to be that he wanted to indicate some unrevealed relationship between his papal investiture and the present day high priesthood of Judaism. 10. This mysterious ecumenical aspiration of Paul VI was repeated in a different way by John Paul II. Regarding his mantle worn at the opening of the bronze door of St. Peter’s Basilica to usher in the Great Jubilee of the Year 2000, JPII purposely ordered it to be made with the same colors of the Jewish ephod – gold, blue, purple, and scarlet – according to a statement issued by the Vatican itself. Again, the ephod was a garment worn exclusively by the Jewish high priest. What was the intention of John Paul II for doing this? The Vatican did not give any further explanation. With such background and taking into due consideration the past history of the Liturgy, TIA thinks that is quite sound to state that there is some mysterious intention behind these two acts that is not being divulged to the public. We hope this explanation will clarify your doubt about our possible ignorance of the liturgical aspects of the rational.